We've already added several new posts to our new blog. This blog will remain in tact, but only as an archive. All new posts will appear at the new GC blog. A few have asked about my most recent sermon at Bethlehem. They have just uploaded all of the messages delivered by guests during Pastor John's most recent absence. 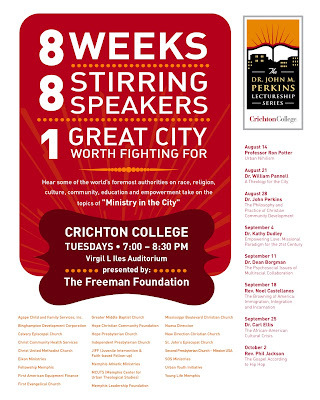 Because of the names you will see at the link to Bethlehem's sermons, this serves as another great opportunity for a commercial: The John Perkins Lectureship series began on Tuesday of this week, and will run for the next seven consecutive Tuesday evenings at Creighton College. Every week (If it is anything like this week) will be well worth attending. I must highlight that Dr. Perkins is scheduled to speak on August 28, and Carl Ellis on September 25. 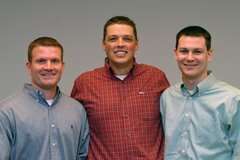 You will not want to miss these brothers! No one in recent days has done more for Christian community development in urban contexts than Dr. Perkins. For those who are unaware of Dr. Perkins ministry click here. Carl Ellis has spoken at the Desiring God Pastors Conference, and also as a guest preacher at Bethlehem. In light of Nate's sermon a few weeks back on family worship, and because we all seem more open to new things around the start of a new school year (which began in Memphis today), it is a great time to begin (or, begin again) with family worship (even if you're single!). Here's some good counsel from Lig Duncan. This one is easy. I most love worshiping through the Word of God with Grace because such a high percentage of the people come to the services with a prepared and consecrated heart having already spent time reading and praying through the day's sermon text. I simply cannot express the joy of preaching to a prepared people. Rather than being intimidated because the people may know the passage better than I do (which is likely), I am thrilled because the Holy Spirit has more ammunition to work with in each person's life. So, when I stress a point a certain way, the Spirit may bring to an individual's mind and heart the thoughts he had on the previous Thursday when praying through the same text. And in combining my thought with the individual's thought, the Holy Spirit is driving the truth even more deeply into the person's life. Isn't that part of the main goal in preaching anyway (along with glorifying God)? "Sunday is sacred because we get to sing corporate praises to God, fellowship with other believers, and above all else, hear the precious word of God preached." One may ask: Prepare? For corporate worship? Why? I simply come to church and sit and listen. How can I prepare? Why should I? "In the Old Testament, the people of God prepared for sacred days, they consecrated themselves. There were special rituals of washing and cleansing that each person had to perform before being allowed to participate in the sacred day. (Read entire article here; HT: TC). Since I'm made increasingly aware that other pastors are reading this blog, may I take the liberty now to share a word of challenge with those of you who are pastors? (Though I'm certain that I have much more to learn from you that I could offer). Would you consider giving your sermon text to the people in advance? Take heart, it is much easier than you might think. 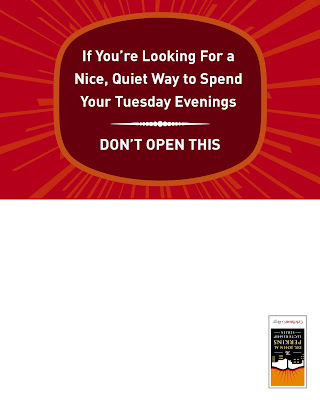 And, you are not "locked" into the text. If the Spirit leads, go someplace else. After all, I don't think it will harm our people too much if they have given generous attention to the "wrong" text! Here's the incentive. I trust that you too will feel your people pulling the word of God out of you like I feel it from our little congregation in downtown Memphis. It is truly life-giving to have this experience almost every week! And, as another incentive, I think it will make you prepare better knowing that the people are preparing too (It has this effect on me)! Certainly my love for preaching at Grace can be attributed to many things (I love the people, I'm a member of the church, etc. ), but above all, I'm persuaded that it has to do with the way the people make preparatory use of something we call our "church card" (see image below) which we hand out at the beginning of each new preaching series. Each one looks a bit different, but they all carry the same idea. Feel free to use our idea, or modify it, but for the sake of your elevated joy in pastoral ministry, consider giving the people your text in advance. My guess is that you won't be sorry you did. In the most non-flattering way, I just want to thank God for you, Jordan, and for your obedience to the Lord in preparation for the sermon this morning. It was evident that you had sought the Lord's face concerning the text. Being pointed to Christ under the preaching of the word is invaluable and necessary for sanctification. Nathan and yourself have been careful and diligent with the preaching of the word, and I truly thank God for placing my family among that kind obedient diligence. 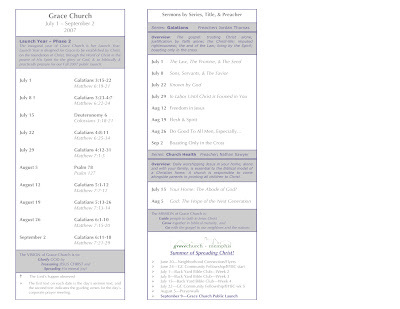 May God continue to give you favor in sermon preparation for the spiritual health of Grace Church and its visitors. I was encouraged to seek God for my benefit and challenged to prepare excellently for the preaching of His word. May the Lord lead me to place His yoke of freedom around this baby oxen neck. Anyone wanting to comment further concerning this morning's sermon to continue to spur one another on please do so by replying to this post. How would you like to hear one of Christ's apostles say that to you? Me either! Yet, that's exactly what Paul says to the Galatians in our sermon text for tomorrow in 5:4. See you at 9a for prayer, and 10a for worship! Have you been keeping up with the baptism/church membership discussion going on between Piper and Grudem? Justin Taylor pointed out that Grudem rewrote his chapter on baptism for the newest edition of his Systematic Theology book (If you don't own it, buy it!). John Piper asks Wayne Grudem "Why," then states his own position. Grudem responds to Piper with his reasoning for his shift in position. This is an example of how brothers in Christ should express disagreement with humility, love, and respect...while not forfeiting his convictions. Where's that reply? Normally, you would have receive one. However, the GC pastors are without email for _______ (hopefully only a few days) while our web company's server is under repair. Tracy and I have made it back safely to Memphis, and are unloading our loving-affection on our our children. Thank you again for your prayers for the camp. It appears that a few of students reckoned with God. The day will tell it. I am delighted to encourage as many GC'ers to attend this eight-week Tuesday evening series as regularly as possible. (Click the images for larger viewing). Have each gone well. The Lord's nearness in our sessions has been evident. There are several non-Christians at this conference and tonight's talk will be focused on the cross of Christ (7p here, 6p CST). Thank you again for your prayers. Went well. Thank you again for your prayers! Challenged the group from Matthew 25 about seeing God (rather than self) as the end, flowing out into a lifestyle of spiritual reproduction (i.e. discipleship). We missed our GC family today, and heard that the Lord was near in the prayer and preaching services. SDG! I will appreciate your prayers as I will be speaking at a discipleship camp for a church in Boston this week.